Ohio Wesleyan’s Seth Clark (4) puts up a shot between Wittenberg’s Connor Seipel (54) and Rashaad Ali-Shakir (5) during the first half of Wednesday’s NCAC showdown at Branch Rickey Arena. Seth Clark’s three-point play with 3:36 remaining gave the Ohio Wesleyan men’s basketball team the lead for good as the Battling Bishops overcame a 19-point deficit to hand fifth-ranked Wittenberg an 85-80 NCAC win Wednesday night at Branch Rickey Arena in Delaware. Clark corralled his own missed three, drove the lane, drew contact, made the basket and converted the three-point play at the free throw line to give OWU the lead for good. “We just want to be playing well going into the tournament and obviously a win like this can springboard us,” OWU coach Mike DeWitt said. OWU hands Wittenberg, which opened the season with 22 straight victories, its second straight loss and keeps the regular season title out of their hands for one more game. The Bishops (16-8, 11-6), meanwhile, snapped their own two-game losing streak. Nate Axelrod scored 18 points in the second half and finished with 22 points and Clark, Will Orr and Grant Gossard added 14 points apiece to lead the way. Jaret Gerber’s three-pointer with 14:06 left in the first half tied the game at 10-10, but OWU went scoreless for the next 4:45 as Wittenberg rang up 19 points to seemingly blow the game open. James Johnson knocked down a pair of threes and scored 10 points to pace the Tigers during the run. Orr finally ended the drought with a layup at the 9:21 mark, starting a 24-4 run that Orr capped with another driving score to give OWU a 34-33 lead with 1:35 remaining in the opening half. “It just shows us that even when we’re down in certain situations … if we fight hard enough and we believe in each other enough … we can do anything,” Orr said. Orr led the Bishop run with nine points and Gossard scored seven. 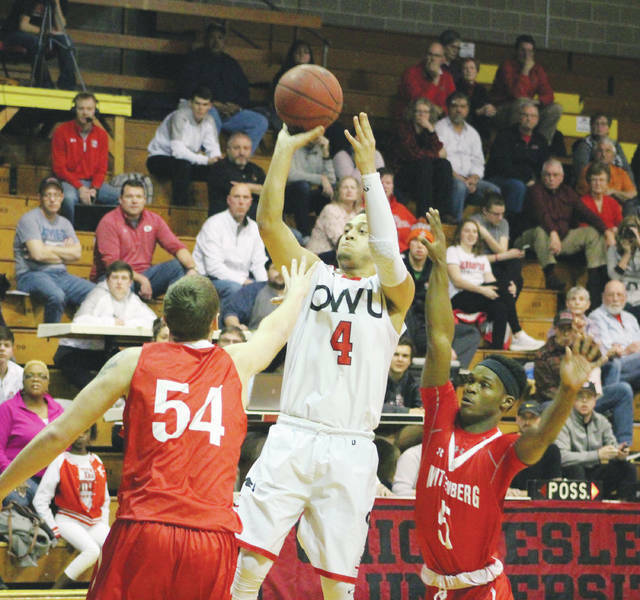 OWU hit four of its six first-half three-pointers during the go-ahead run. Axelrod, who was held scoreless until the 2:29 mark of the half, beat the first-half buzzer to give the Bishops a 38-37 lead at the break. Neither team was able to get much breathing room in the second half. Orr scored OWU’s first five of the second half, including a three-pointer to give the Bishops a four-point advantage. But, Wittenberg scored six of the next eight to take the lead again. Derrick Wyche, held out of the game in the first half, made an impact with a three-point play to give OWU the lead again with 8:11 left. Adam O’Brien’s three pushed the Bishop lead to five on the next possession – their largest of the game. Wittenberg followed with a 7-2 spurt, capped by a Mitchell Balser three-pointer to tie the game 76-76 with 4:38 remaining. Roy paced the Tigers (22-2, 15-2) with 24 points and Johnson and Connor Seipel chipped in 15 points apiece. OWU wraps up the regular season at home against Allegheny Saturday at 3 p.m.